Glazed Christmas Ham is a Kiwi tradition at the Christmas dinner. 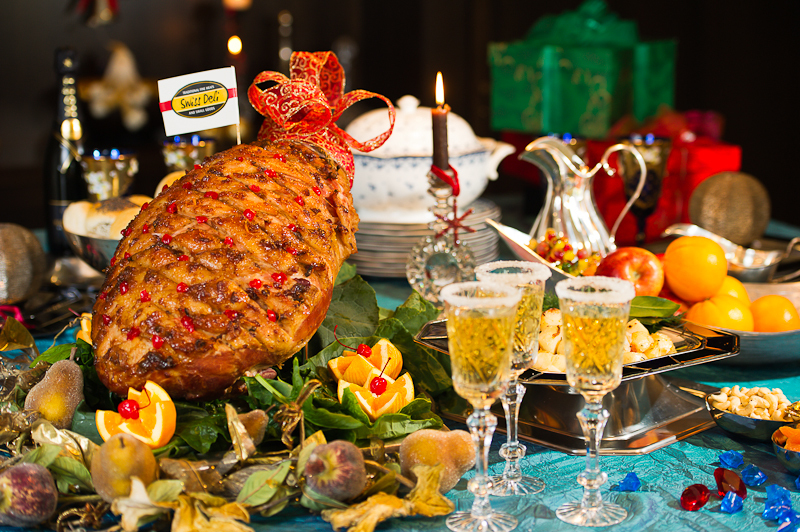 Below are the tips from Swiss Deli on how to perfectly prepare a glazed and decorated ham for an impressive Christmas table. 1 - Preheat oven to 90 C.
2 - Cut off the rind; Score the fat into a neat diamond pattern by making diagonal cuts approximately 3 millimetres deep. 3 - Press a clove into the centre of each diamond. 4 - Spread half the glaze Swiss Deli Orange Glaze over the ham. Let the ham rest for 30 min before cooking. 5 - Place on a rack in a large roasting pan and pour 2 cups of water into the dish. Cover the ham with foil. Cook in an oven for 50 minutes. 6 - Remove foil, brush the ham with the remaining glaze. Rise the oven temperature to 180 C. Keep Ham in an oven until the surface is lightly caramelized (aprox. 10-15min). 7- Take out of the oven. Decorate with cherries by sitting them on the cloves. 8 - Serve hot or cold. Cover left overs with a clean wet tea towel or ham bag and store in the coldest part of the refrigerator. Replace with a clean tea towel daily.